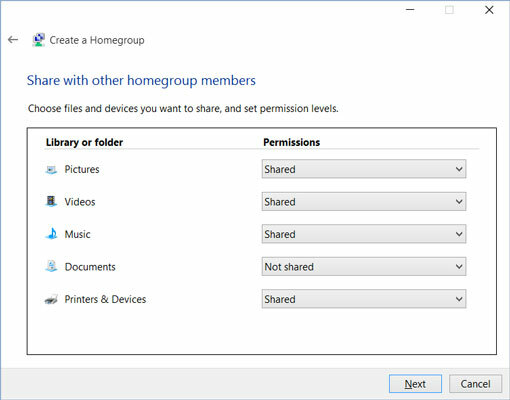 You can also join a homegroup by selecting Homegroup in the navigation pane of File Explorer. Select the Join Now button and select Next on the following screen. You see the Share screen. On this screen, declare which folders and which devices you want to share with others in the homegroup, and click or tap the Next button. On the following screen, enter the password to the homegroup and then click Next. If all goes well, you are admitted to the homegroup, and you can select the Finish button. The person who created the homegroup can give you the password. If that person doesn’t remember it, he or she can select the View Password button on the Homegroup tab (refer to Figure 14-19, bottom) to see what the password is. 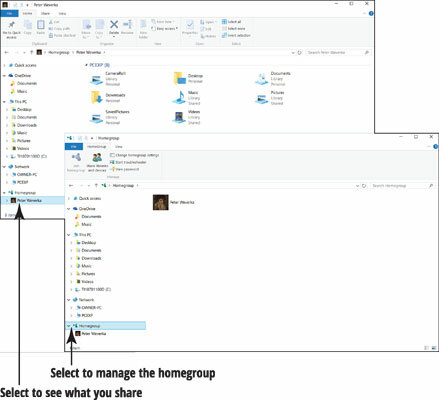 Open File Explorer and, under Homegroup in the navigation pane, select the name of the homegroup you joined. The content area shows you the names of folders and devices shared by members of the homegroup. Select a folder or device to access it.